In a televised speech from the White House on Thursday, Trump threatened to close the Southwest border to asylum-seekers — including the latest group of Central American migrants making their way through Mexico — unless they present themselves at official ports of entry. But refugee and asylum experts say his plan would violate U.S. law. They say the president's remarks about asylum were riddled with inaccuracies and misleading statements intended to stoke fear of immigrants and drive the president's supporters to the polls. We'll focus here on five statements President Trump made Thursday in the Roosevelt Room. "The current influx, if not halted, threatens to overwhelm our immigration system and our communities, and poses unacceptable dangers to the entire nation." The total number of migrants apprehended at the Southwest border was actually down slightly last year, to about 521,000, and remains far below the kind of apprehension numbers that were routine in the 1990s and 2000s. But the Trump administration argues that the current "crisis" is the result of a major shift in who is showing up at the border. A generation ago, migrants apprehended at the border were largely single adults, mostly from Mexico, who could be deported relatively quickly after they were caught. Today migrants are much more likely to be coming from Central America. Last year, a record number of apprehended migrants were part of family units. That means they have greater protections under U.S. law. In practice, many of these asylum-seekers are released into the U.S. to await their day in court, which can take months or years. 2. No more "catch and release"
"These policies lead to the release of illegal aliens into our communities after they've been apprehended. But we're not releasing anymore. Big change, as of a couple of days ago. We're going to no longer release. We're going to catch; we're not going to release. They're going to stay with us until the deportation hearing or the asylum hearing takes place. So we're not releasing them into the community." In fact, under U.S. law, migrant families who have requested asylum are not considered illegal immigrants. And they are being released in large numbers up and down the border. In El Paso, Texas, Ruben Garcia, director of a local shelter called Annunciation House, told reporter Mallory Falk of member station KRWG the shelter had received 332 people Thursday released from immigration custody and are expecting 225 more Friday. In Arizona, Matthew Casey of member station KJZZ spoke with an official at Capellania Cristiana Llamados Para Servir, an organization working with churches in metropolitan Phoenix. The official confirmed the organization expects 90 families at two different churches on Friday and 400 more migrants from Yuma to start arriving in Phoenix late this weekend. 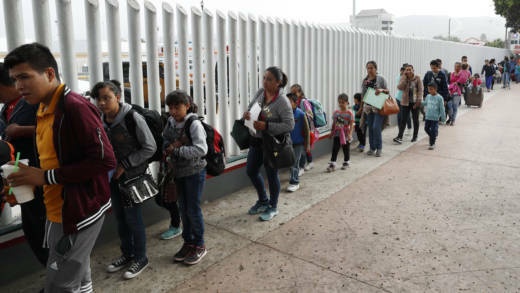 These migrant families are generally released to join relatives in other parts of the country and will be issued a Notice to Appear in immigration court for their asylum hearing. "Then they never show up, almost. It's like a level of 3 percent. They never show up for the trial. So by the time their trial comes, they're gone. Nobody knows where they are." Actually, the majority of asylum-seekers do show up to court. According to the Department of Justice statistics for the 2016 fiscal year, only about 2 in 5 cases were decided in absentia. Immigrant-rights advocates say the number of asylum-seekers who do show up would be even higher if they had attorneys and more support from court staff to let them know when and where to show up. They point to a pilot program that was highly successful at getting immigrants to show up in court before it was canceled by the Trump administration. "This endemic abuse of the asylum system makes a mockery of our immigration system, displacing legitimate asylum-seekers — and there are legitimate asylum-seekers — while rewarding those who abuse or defraud our system, which is almost everybody. Everybody is abusing it." Immigration lawyers say this is a wild exaggeration. It's true that only a fraction of all asylum claims are actually successful. Last year, immigration courts rejected more than 60 percent of asylum claims, a number that has been steadily rising since 2012. The administration argues that rejection rate is itself evidence of fraud. But immigrants-rights advocates dispute that. They say immigration courts are supposed to decide each asylum case on its own merits and that the low acceptance rate is simply evidence that the system is working — and that asylum cases are not easy to win. "Some people call it an invasion. It's like an invasion. ... These are tough people, in many cases. A lot of young men, strong men." The president has claimed repeatedly, without evidence, that the migrants include dangerous criminals and "unknown Middle Easterners." But reporters on the ground say the migrants comprise mainly women and children who are fleeing from violence and extreme poverty in Central America. Refugee and asylum experts accuse the president of fearmongering to rally his political base for the midterm elections. There's a "tragic irony" in portraying the asylum-seekers as a marauding army, said Karen Musalo, director of the Center for Gender and Refugee Studies at U.C. Hastings College of the Law. "Individuals have come together to walk north in a caravan because the journey north for asylum-seekers has been so dangerous," Musalo said in an interview. "These are very vulnerable individuals, desperately fleeing violence, who have come together as a group to have the protection and solidarity of each other."